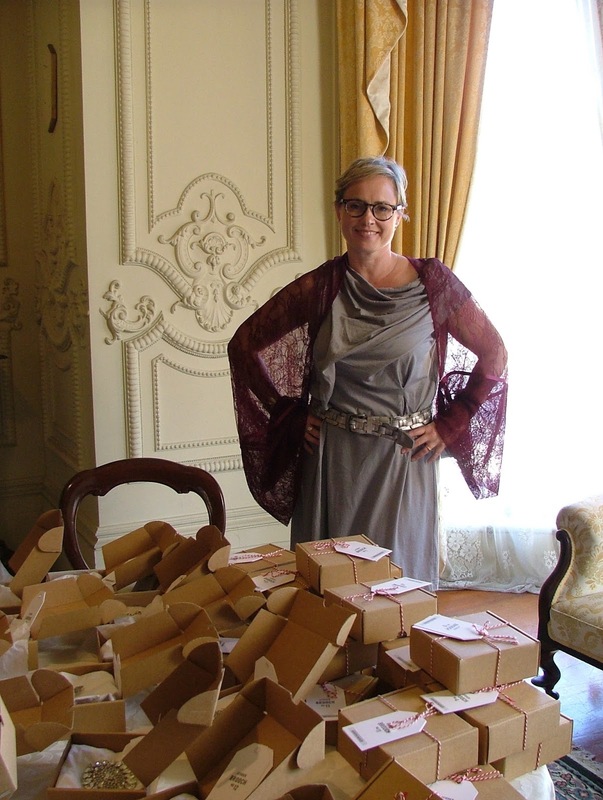 Once upon a time, a girl received an invitation, to attend a one on one evening meet with Emmy Award Nominated Costume Designer Marion Boyce, in the grand Victorian era National Trust Labassa Mansion. That girl was me, and this is my story. Marion Boyce, is best known for her costume work on Australia's treasured crime series Miss Fisher's Murder Mysteries, set in 1920s Melbourne. Hollywood also beckoned Marion's costume design skills for the award-winning movie The Dressmaker, set in 1950s Australia. 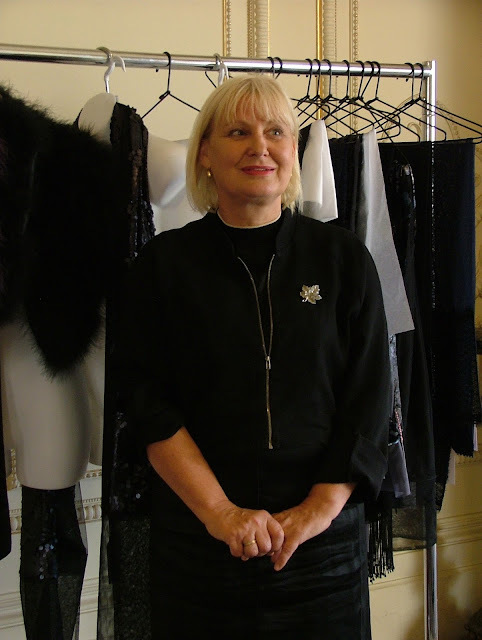 Marion Boyce won an AACTA award for her work on Series 2 of Miss Fisher’s Murder Mysteries, and Best Costume Design for the feature film The Dressmaker. When it was suggested I could bring a 'plus one' to meet Marion Boyce, I could think of no-one I'd rather ask than clothier, blogger and friend Annabel Butler of Clothe. 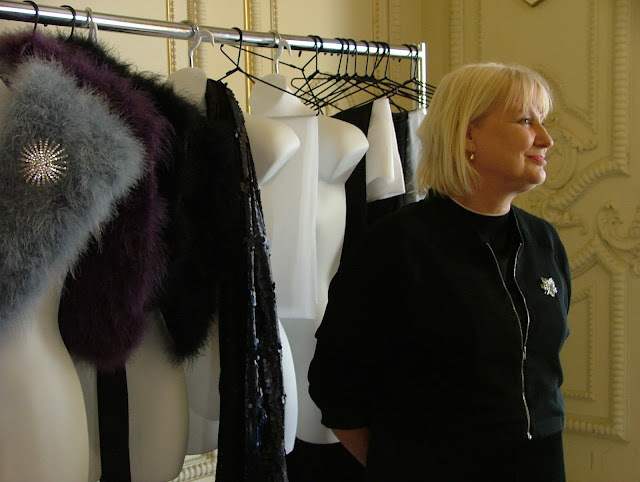 The focus of the evening with Marion pointed toward her exclusive designed Miss Fisher Collection - Marion Boyce. That said, it was a pleasure to spend time with Marion, getting know her inspirations and passions behind her most admired vintage inspired fashions. Although much of Marion's costume work is designed and made from scratch, much of the adornments on her exquisite pieces, are re-purposed from old (such as trims, braids, lace and ribbons). Marion refers to herself a 'collector'. When jet-setting to far-away lands, she talks fondly of fabrics found in Italy, and sari textiles from India. 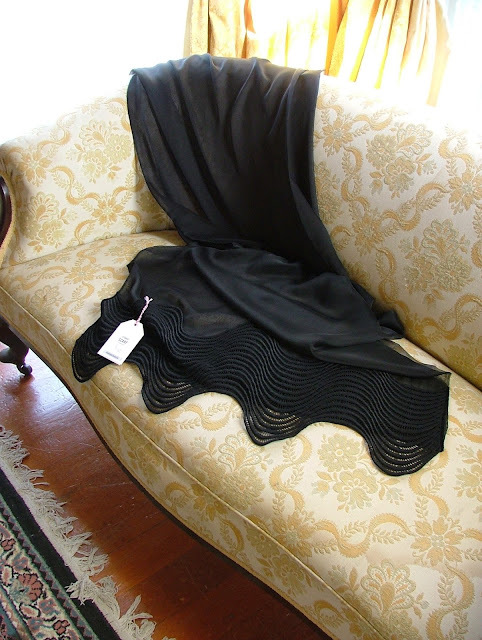 She jokingly adds that her patient husband always locates the nearest FED X depot wherever they travel, to ship the aforementioned textiles back to Australia. 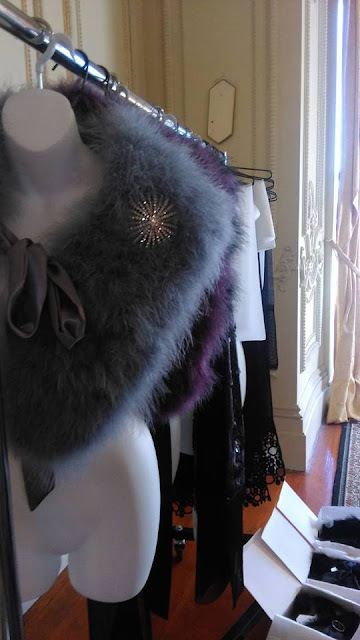 As we look through the Miss Fisher Collection, I notice sparkles and Annabel notices movement and swish on Marion's sequinned scarf. Fashion accessories are made in very small quantities, with rare materials sourced by Marion. Anyone familiar with Miss Fisher's Murder Mysteries would assume Marion's fashion forte would be the 1920s. She agrees that late 20s and early 30s is a fashion era Marion is most fond of, "Post-War when people could have fun with fashion again", she says. Miss Fisher's Murder Mysteries' main character is a glamorous lady detective, The Honourable Miss Phryne Fisher. She is often seen wearing ornate brooches, sometimes pinned to unconventional places (on the hip of a dressing gown, for example). 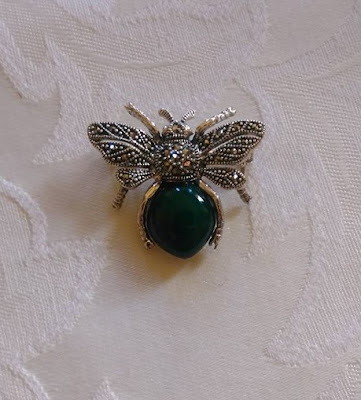 Marion's brooch collection features inspired 1920s designs; the silver and green bee brooch caught my eye in an instant. Ornate insect brooches were not uncommon in 1920s, and the bee brooch Marion tells us, is one of her favourites, too, "Because it is topical, with today's concern over diminishing bee colonies". Plus, she tells us, gardening is her relaxation time, and she practices beekeeping at home, which "produces 27 litres of honey a year". 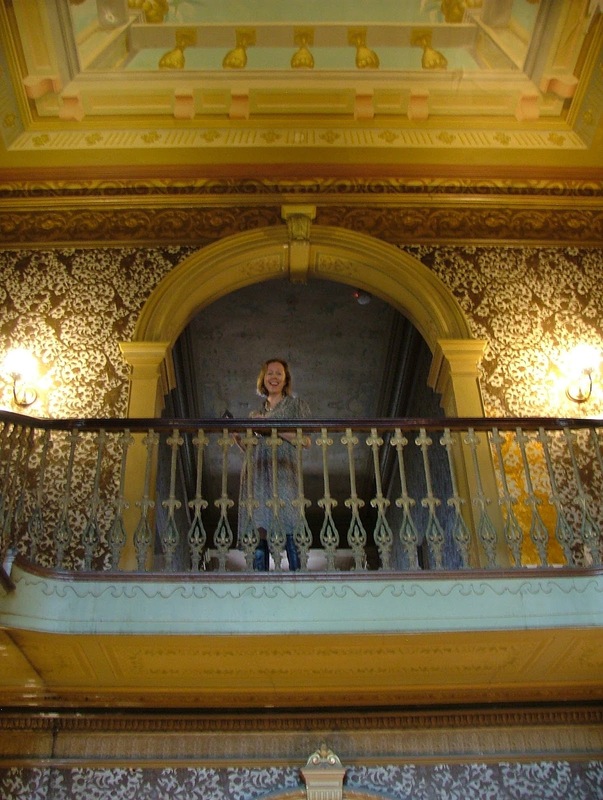 I should also mention, the stunning 19th century manor in which our meet-and-greet took place; the Labassa Mansion. 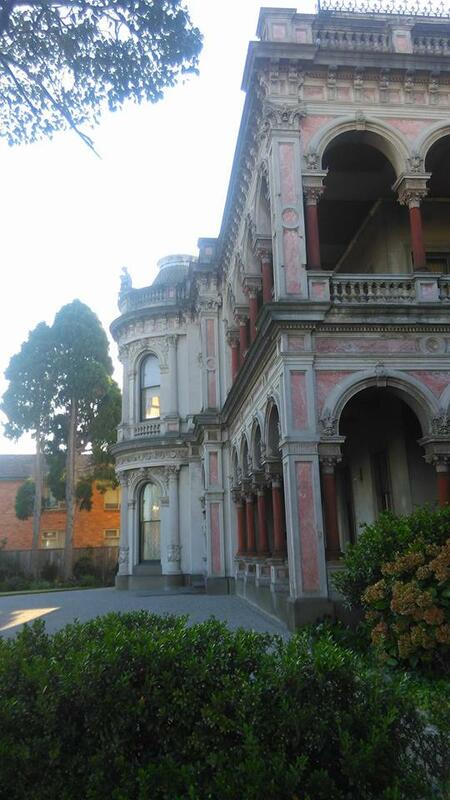 Much of the lavish property, tucked away in Caulfield North, remains intact, despite once housing squatters before the National Trust took ownership. Labassa features gilt embossed wallpapers, ornate stained glass and a rare trompe l’oeil ceiling. If Labassa Mansion's walls could talk, many stories would be told, for the property housed some of Melbourne's elite in the 20th Century. One resident, starlet Louise Lovely, was the first Australian silent film actress to succeed in Hollywood. Louise Lovely? No.. it's just Erica Louise! These days, Labassa Mansion is open to the public on the third Sunday of each month. Otherwise, the lavish estate is used to film TV shows such as Miss Fisher's Murder Mysteries and Upper Middle Bogan. Labassa's grand sweeping staircase with magnificent stained glass window is used as a backdrop for wedding shots and fashion magazines. A meet with Marion Boyce proved quite a memorable occasion. Next time I watch an episode of Miss Fisher's Murder Mysteries, I will study each costume in greater detail, knowing the importance that fashion has to convey the 1920s in the famed TV show. 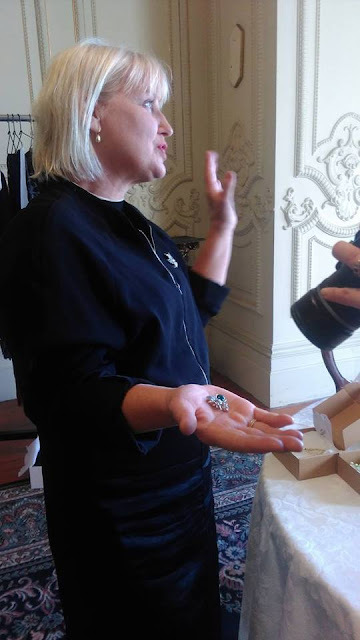 Miss Fisher inspired jewellery and accessory range from the award winning Costume Designer Marion Boyce is undoubtedly big news for loyal Miss Fisher's Murder Mysteries fans. Add a piece of Miss Fisher inspired jewellery or a fashion accessory to your wardrobe available exclusively at Every Cloud Productions Online Shop. This post is bought to you by Nuffnang and Labassa Mansion. I love the 20 and 30's fashion inspiration. They always did look like they were having fun during that era. Looking at photos of my grandmothers...born around 1910, family photos were fashion and smile savvy. I have a few pieces of jewelry from them...watches, lockets and of course a brooch or two. I wear them often. They are very subtle which suits my style. I am an avid Miss Fisher fan as well....I adore your work.